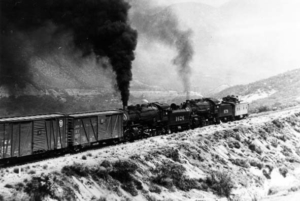 Photos of trains are probably the most dramatic railroad images. The Santa Fe, crossing the western portion of the U.S., had a wide range of scenery for photographers. Some locations had dramatic backdrops while others were less interesting. 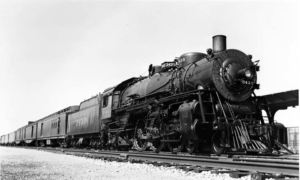 The Society’s two archives have a large collection of train photos that provide extensive coverage of the history of the railroad and also provide good geographic coverage. Below are a small sample of the Archives’ holdings of passenger, freight, mixed, switch jobs, and work trains. 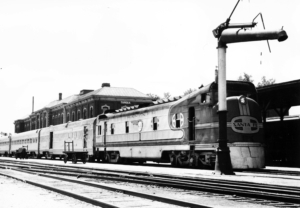 Passenger Trains. 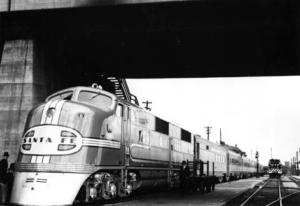 Prior to 1960, passenger trains were the most photographed trains. 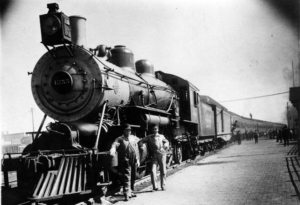 Santa Fe long-distance passenger trains were first class all the way with luxurious extra fare limiteds catering to a passenger’s every need. At the same time, photographers captured even the more mundane local passenger trains. 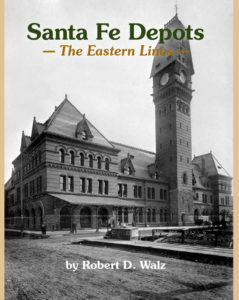 All these trains contributed to the Santa Fe’s reputation for superb passenger service. ATSF 3433 (4-6-2) on No. 1 The Scout at Wichita Union Station in July 1938. David Martindale photo, Lee Clerico collection. 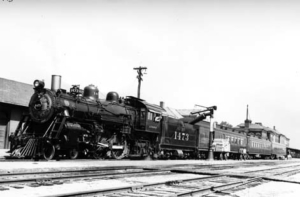 ATSF 1 (Amos) is pulling train 12 The Chicagoan at Topeka on May 30, 1939. Ray Hilner photo, Lee Clerico collection. ATSF 8 (E1A) on the point of a display of the equipment of the Chicagoan/Kansas Cityan on April 15, 1938. Ray Hilner photo, Lee Clerico collection. ATSF 1473 (4-4-2) is pulling No. 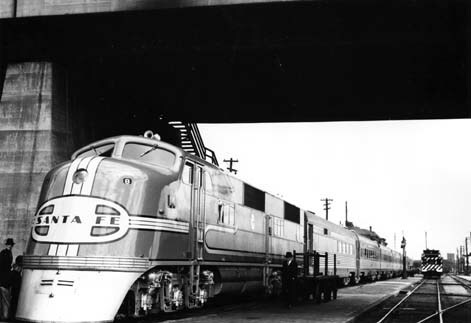 25 Emporia Express at Topeka on August 21, 1938. Ray Hilner photo, Lee Clerico collection. Freight Trains. While passenger trains are the glamorous stars of railroad photography, freight trains are the unsung heroes of railroading. 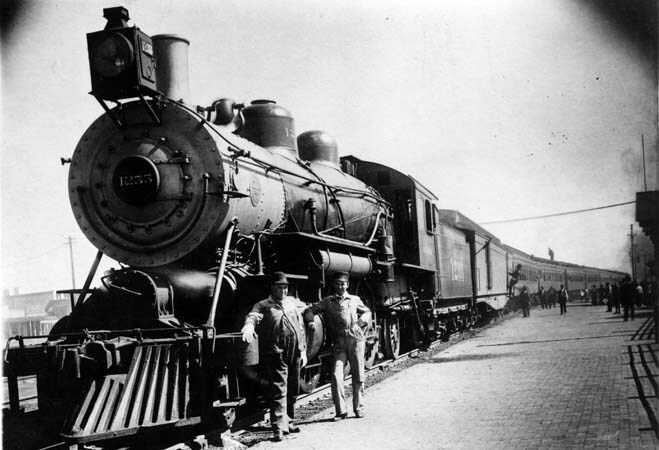 Through World War II, freight trains delivered most of the goods for every town and city on the system. 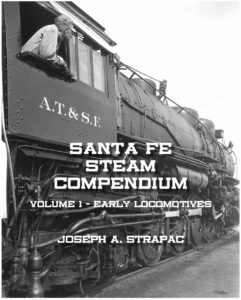 Here is a sample of Santa Fe freight trains from long distance through freight trains to local peddler way freight trains. ATSF 3452, 3176 (3450 class 4-6-4 and 3160 class 2-8-2) are on an eastbound freight No. 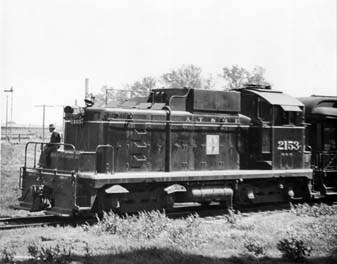 32 at Newton, on April 11, 1948. Giles Stagner photo, Lee Clerico collection. 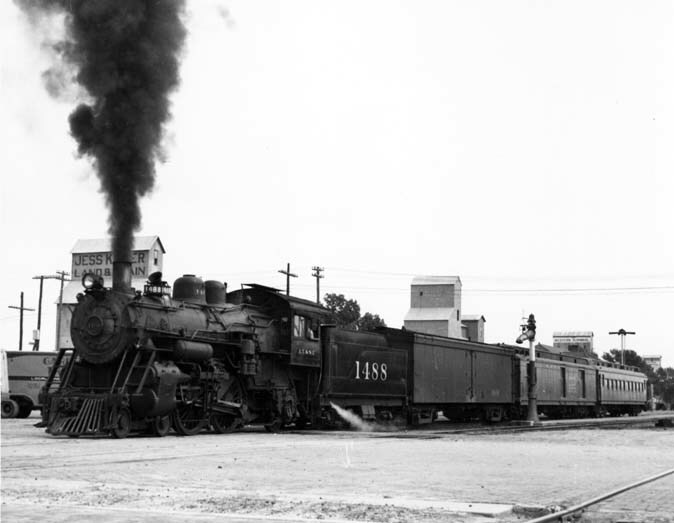 ATSF 3818 (3800 class 2-10-2) is on a westbound freight train at Augusta, Kansas, on May 11, 1947. Giles Stagner photo, Lee Clerico collection. 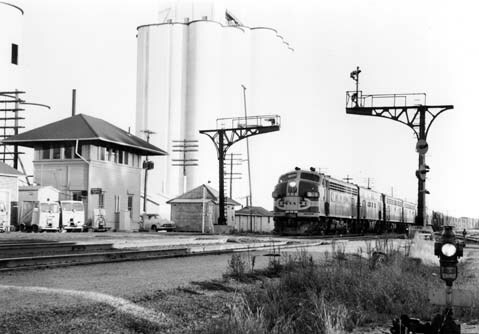 ATSF 237 (F7) leads a freight past the tower in Mulvane, Kansas, circa 1965. M. Erkolein photo, Lee Clerico collection. 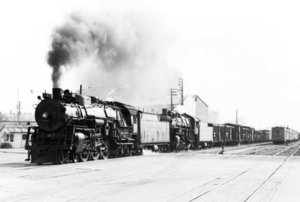 Mixed Trains, Work Trains, and Switching. 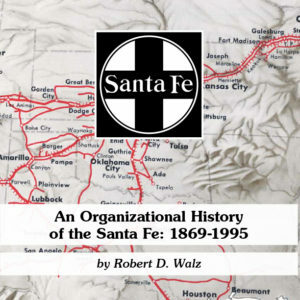 These less glamorous, but essential, operations are the least photographed of all Santa Fe operations. Yet they have a fascination all their own. Mixed trains are usually found on branch lines. Work trains usually have interesting consists. Switch engines making up and breaking down trains in yards, both large and small, are essential to the movement of passengers and freight. Here is a small sample from the Clerico collection at the Temple Archives. 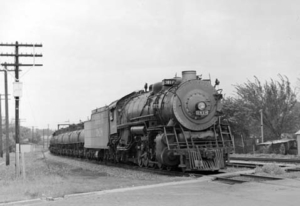 ATSF 2153 (SC with steam generator) is switching passenger cars at Topeka in 1938. Lee Clerico photo. 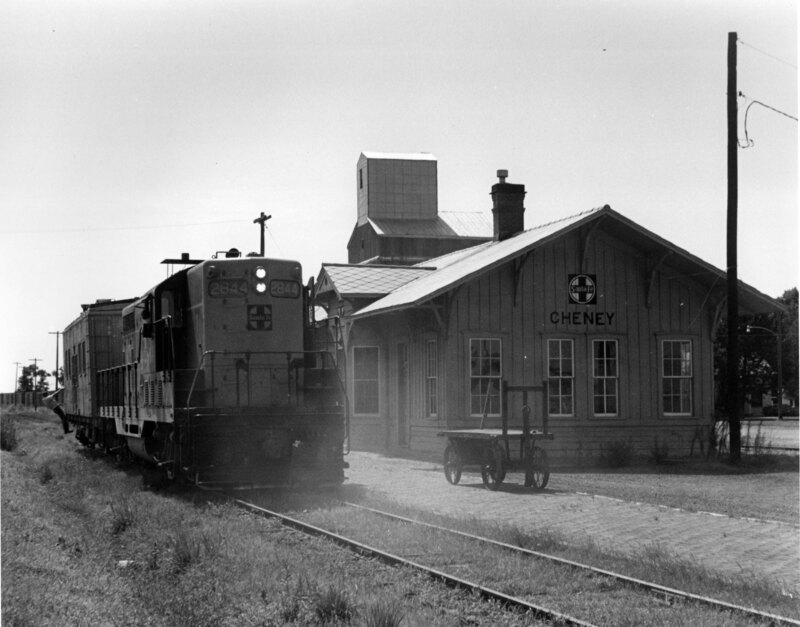 ATSF 2844 (GP7) switching at Cheney, KS, on the Wichita District circa 1966. Lee Clerico photo.